Exploratorium is one of my favorite places to look for interesting science lessons, activities, and iPad apps. If you head to the Explore section of Exploratorium you will find a great mix of online and offline activities that students can do to learn about the science that is around them in their daily lives. Two of the activities that I like that are currently featured on Exploratorium's Explore section are Pickle Lab and Kosher Dill Current. 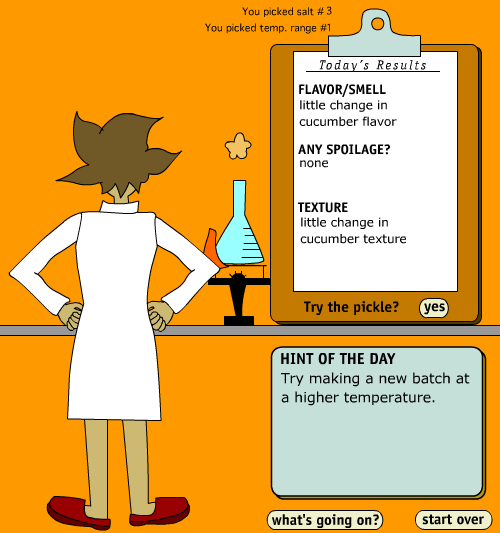 Pickle Lab is an online activity in which students experiment with the quantity of salt, temperature of their pickling solutions, and length of time to make pickles. In each round of the activity students get feedback on whether or not their chosen combinations of variables will or will not produce a quality pickle. Kosher Dill Current is a hands-on activity in which students create a electric circuit using a pickle and some other fairly common household goods (the alligator clips and buzzer are the only things you might not have at home, but can get cheaply at Radio Shack). The purpose of the activity is to help students see how two metals suspended in an ion-rich liquid or paste separate electric charge and create an electrical current around a circuit.